Ever since I was younger, I was intrigued with fashion design and sewing. I thought the creative process was interesting for fashion design and sewing. It was, and still is, interesting because you are able to sketch, design, create, sew and then wear your own designs. Growing up I took as many fashion design and sewing classes as I could. I thought I was going to be a true fashion designer and go to the school of the art institute. However, life changes and so did my path. I decided to attend DePaul University in Chicago and I received my BA & MA in Communication. Shortly after that, I worked full time and gained professional experience. My passion continued for fashion design and sewing. I slowly started teaching sewing classes locally as a hobby, while working full time. Then, popularity of the sewing classes grew and I started teaching more classes locally at various park districts, community centers and schools. 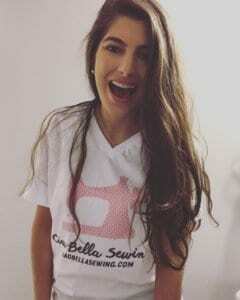 I was able to leave my full-time job and pursue my true passion of sewing! 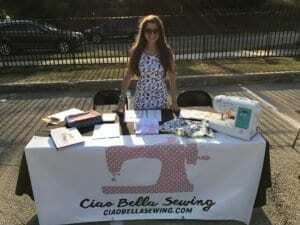 During this same time, I opened up the Ciao Bella Sewing Studio in Winnetka and it has been open and running for a year and a half now. I mostly teach sewing and fashion classes to children and adults. I couldn’t be happier doing what I absolutely love! I am very fortunate and blessed; I truly enjoy going to work each day!